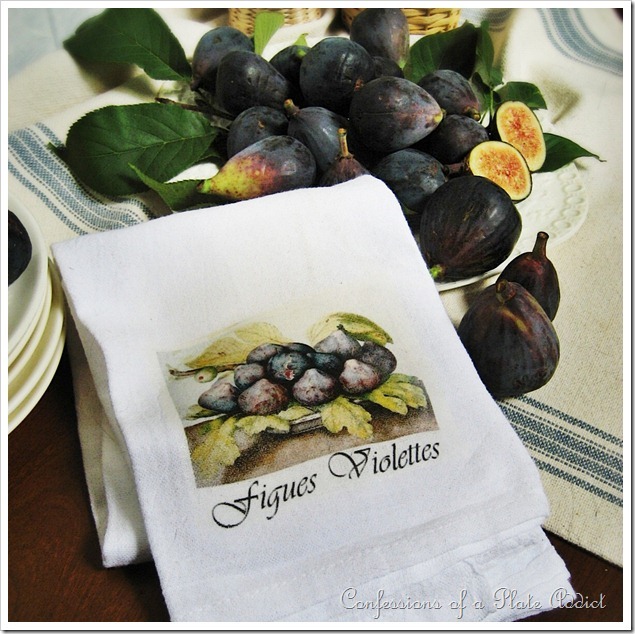 CONFESSIONS OF A PLATE ADDICT: Fall Figs and a Tea Towel to Make! Fall Figs and a Tea Towel to Make! And, of course, I can’t do a post without my trusty sidekick and co-host Baby Kitty! He is a big fan of fruit, believe it or not, but peaches and strawberries are his favorites! And here they are…my figgy loves! Aren’t they gorgeous? Gotta love the fabulous shades of purple with little pops of green on the outside! But the inside…a real explosion of unexpected color and yummy goodness! Don’t they just look like a painting? In fact, they always make me think of this painting…A Plate of Figs by one of my favorite artists...Giovanna Garzoni. Isn’t it amazing? And get ready for this…it dates from 1662! Can you imagine? She was one of the first female artists to work with still lifes and became well-known in a world where all of her contemporaries were men! Incredible! I added the script underneath to give it a little frenchy touch and flipped it for you to use as a transfer. If you would like to read more about her, click here and if you would like to see a lovely slide show of her work set to music, click here. I just printed it on iron-on transfer paper and followed the directions to apply it to flour sack cloths from Target…easy peasy and practically free since I already had everything in my stash! Then of course I had to play with the tea towel and the figs to try to create a little still life of my own in the sunlight and shadows created on my dining room table by my Palladian window! And for me, you cannot have figs without bleu cheese! And even better, I lucked up on some roquefort at Publix the other day, but I can’t show that to you since it has already…er…disappeared along with part of the figs! Thanks for stopping by! I hope you enjoyed a little peek at my little project! Please visit these wonderful bloggers and their beautiful blogs to see what they are up to and to find a list of this week’s participants! Another winner, Debbie! Your tea towel goes perfect with your real figs and I love how your pictures turned out. Good Morning Debbie, I love this tutorial. When I lived on the Island of Cyprus we had a fig tree in the garden, so when wanted to eat figs we just picked them off the tree...sigh. They are my favourite fruit. Now we live in England I have to visit the market. Debbie, I love this post! Your tea towels are beautiful; and your photography is, too! Wow! Beautiful photos Debbie! Does Baby Kitty like Bleu cheese with his figs?I can't wait to make that pretty towel, thank you for the graphic! These are just gorgeous photos. I love fresh figs. The towel came out beautifully. Beautiful! And I absolutely love Giovanna's work. Thank you for sharing her! Really beautiful! Very romantic and old world! Gorgeous, gorgeous transfer Debbie...My friend and neighbor has a beautiful fig tree...will have to pop over and see if she has any left...!! Have a great day! Love how the towel came out - beautiful! Thanks for the inspiration. I too love figs Debbie. I grew up picking buckets full (!) near Atlantic Beach in NC. I guess a bucket of figs would cost about $200 in a grocery store today! The towel is beautiful and I will be giving those for Christmas gifts. What kind of transfer paper do you use? Thanks for joining The French Hen's Nest! How incredibly gorgeous! You are so creative and smart. Someday maybe you'll have an Etsy shop? I'll tell you a delicious way to cook figs....wrap each fig in about 1/2 piece of bacon and place on skewer. We grill them until the bacon is crispy. Oh my. Purely delicious! You should frame that one pic....amazing...seriously prettier than ones I see in the stores! I want to make some of those towels so bad. My printer is being temperamental right now! Maybe soon. They are beautiful. Great post!! Your tea towels just keep getting better and better, dear friend!!! Of course, it wouldn't have anything to do with that handsome co~host, now would it??? Your "still life" is gorgeous!!! I don't recall eating a fresh fig before. I do love fig cookies...I'll look for them at our local marketplace this week! What a pretty towel Debbie! You are always coming up with such cute ideas! Love those pretty figs. Used to have figs available from a friend when we lived in NM and I sure do miss those yummy fruit now that I can't get them here in CO! Beautiful, Debbie! You always have the best projects! I appreciate you sharing your creativity at Potpourri Friday! If I was around those props, Debbie, they would not have lasted through the photo shoot--those are some of my favorite foods! That tea towel is just gorgeous, and Baby Kitty is clearly a very good helper kitty. Our kitties do not go after fruit, but Trafford the cat will eat tomatoes if they are left out! Very nice!I love your cat! I love your weekly creations. And I love the french touch to everything you create. My new favorite place is France. I have France on my list of places to visit. Thank you for your inspiration. That looks fantastic! I love the print, so inspiring to make tea towels! Hi Debbie! Now that's a tea towel! Oh, what a beautiful graphic and you made a gorgeous tea towel. My little tea towels are bowing in embarrassment after seeing yours. Of course, Baby Kitty is always so charming. 4-H Club (I was 7). YOur table full of figs, blue cheese and white wine...now that is a supper. So love this post. You have just motivated me to go buy a package of transfer paper. Beautiful pictures! I love fresh figs and blue cheese!! I bought those towels at Target about a year ago Debbie after seeing some of the other ones you made and I still haven't tried adding a graphic to them! Love yours! Hi Debbie, Oh those purple figs look beautiful on the white plate. Your photos are just gorgeous and I love how you photographed your vignette. Debbie, it's absolutely normal for you to create a tea towel for anything! It you didn't we'd all be worried about you. AND, your co-worker is always so helpful, what would you do with BK? "Hi, Baby Kitty." This tea towel is gorgeous, Deb. Love the colours. Do you know I have never eaten a fig. I must try one very soon. That glass of wine looks good, too. Lovely post, as always. Magnificent, Debbie. You have elevated figs to a whole new level and you threw in that gorgeous image to boot. Thank you for sharing this. So lovely! What a wonderful gift idea! I'm FINALLY doing the post on your wonderful soaps and linen towel on my blog this Weds. Finally getting caught up. I love your fig towel too! I LOVE the fig tea towel and I love figs too. My husbands aunt had a huge fig tree in her backyard and I would stand and eat them from the tree. She would always send home a couple of jars of fig preserves with us - I miss that. It looks great! What a beautiful towel! Oooo,,another gorgeous tea towel and I love the color of the mission figs. You're starving me with the roquefort cheese and glass of wine. How delicious! Two of my favorite things in the world - old still lifes and fresh figs. Lovely! Thank you for joining Home Sweet Home!